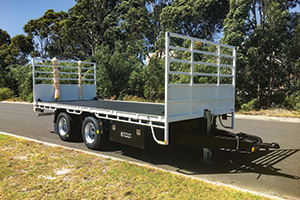 For versatile and effective trailer builds, Austruck Truck Bodies aligns its business with component specialist, Fuwa K-Hitch. The Australian Bureau of Statics released a report on road freight movements* that showed articulated and rigid-bodied trucks in Australia have moved over two billion tonnes of freight over a distance of 17 billion kilometres in the 12 months to October 2014, with just under three quarters (71.2 per cent) of the total tonnes originating in either New South Wales, Victoria or Queensland. Also, over 95 per cent of the total tonnes carried by road were carried within the same state of origin and destination. A spokesperson from the ABS said that “sand, stone and gravel was the most common commodity moved across all states and territories, making up about 23 per cent of the total tonnes moved across Australia”. 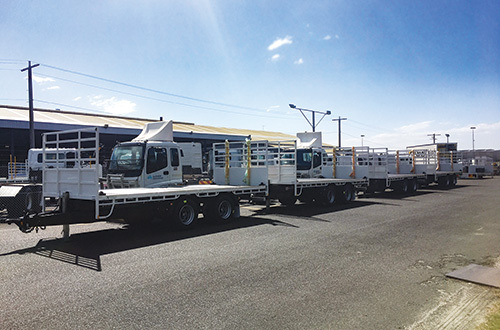 Following positive trends with freight activities across Melbourne, original equipment manufacturer, Austruck Truck Bodies has supported local business with a variety of trailing equipment and rigid-bodied designs including curtain-siders, dog trailers, insulated vans, tippers and beaver tail trays since 1988. Frank says that he supports local industry by investing in Fuwa K-Hitch axles and suspension systems, sourcing what the client needs. “The other advantage of specifying Fuwa K-Hitch is having access to reliable technical support. The team there understand precisely what I need, especially when I am looking for advice on how to get the most out of a particular trailer build. Fuwa K-Hitch Regional Sales Manager, Diaa Bishara, says that Fuwa has been supplying the trailer builder with VDL Weweler air suspension systems with 8-stud drum brake axles that are fitted with Anti-lock Braking System (ABS) and auto slack adjusters for almost three years. “The ultra lite model supplied is a U-bolt type of suspension that allows flexibility for Frank when fitting the full Fuwa K-Hitch range of axle sizes such as 17.5”, 19.5” and 22.5” drum brake and disc brake models,” Diaa says. “Fuwa K-Hitch welds and assembles the suspensions to the axles at nominated chassis rail centres in Derrimut, Victoria, as well as pre-installing additions such as ABS pole wheels, fit brake boosters, sensors and automatic slack adjusters,” he says – adding that this method allows Frank to receive a modular suspension that is ready-to-install, alleviating costly labour and the need to perform critical welding while adhering to torque requirements. Fast Fact: According to Fuwa K-Hitch Regional Sales Manager, Diaa Bishara, in addition to providing axle, brake and suspension systems, the component specialist also provides a full range of products including pneumatic kits for airbags, hubodometers, spring brakes, manual raise/lower accessories, dump valves and landing legs, which he says makes life as easy as possible for original equipment manufacturers from a supply perspective.